The Raspberry Pi is a $35 computer designed to provide a platform for children to learn computer programming. The Raspberry Pi was launched in 2012 and became and immediate success, with the only problem being how to satisfy demand when initial orders exceeded everyone's wildest dreams. Initially many were bought by adult makers rather than the children they were aimed at. Since then the Raspberry Pi has taken off in schools, clubs and with children at home. With nearly 4 million sold it's on it's way to become the UK biggest selling computer ever. The Raspberry Pi has many things that make it ideal for teaching programming to children. It's inexpensive, easy to interface with (through a GPIO connector) and includes a Debian based operating system (Raspbian) with a selection of tools so that children can start programming straight away. The one thing that has let it down is that it is was a little slow. It was still usable and for $35 is better than I ever thought you'd get for that price, but you did need to be quite patient with it. In the three years since the first Raspberry Pi it's been through a few minor changes, first some small changes to make it work better with USB devices, then they switched production to the UK and doubled the memory to 512Mb. They created an even cheaper version (model A) and then increased the number of USB ports and the number of GPIO pins (model B+). Until now it was still based around the same single core ARM6 processor. They've now given the Raspberry Pi it's biggest boost ever by launching the Raspberry Pi 2 with a new quad-core ARMv7 processor and increasing the memory further to 1GB. The previous changes were all very welcome, but this upgrade is a huge leap and makes the Raspberry Pi capable of much more. 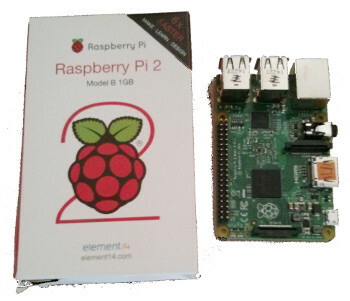 At first look it's hard to see any changes between the Raspberry Pi B+ and the Raspberry Pi 2. The first change is that you can actually see the processor. Previously it was hidden under the memory which was soldered directly on top of the processor. The memory chip is now on the underside of the board and provides 1GB of RAM. The rest of the Raspberry Pi is unchanged, which is the good part. If they had swapped lots of other things on the board or added any of the other features people are asking for then it would have either added more to the cost or risked breaking compatibility with the older Raspberry Pi. There are people complaining that they didn't add various features. Most seam to be complaining about the lack of gigabit ethernet or that they want SATA capability, but these are unlikely to be of any benefit in and educational setting which is after all the aim of the Raspberry Pi. There are few changes to the Raspbian image which is the standard Linux distribution for the Raspberry Pi. I believe there is a new kernel to support the chipset, but otherwise very few changes. This may mean that there is potential for more improvements in speed on the Raspberry Pi 2 if some of the libraries are compiled for the ARM7 processor, but that would need to be done in a way that maintains compatibility with the older versions. The Raspberry Pi 2 is noticeably faster. The claims are for a typical six times increase in performance which is easy to believe. Applications such as Scratch which were slow but usable are now fast and responsive. The processor indicator is also a good indicator which on the previous version of the Raspberry Pi would often be showing 100% is now showing nearer 25 to 40% even with significant applications running. There is nothing new installed by default, but there is now much more software available that would either not run or be too slow to be usable before. The Raspberry Pi comes with it's own web browser based on Ephiphany which is specially tuned to get the most out of the processor on the original Raspberry Pi, but I wanted to try a more modern browser. So one of the first things I installed was Ice Weasel which is Firefox renamed by Debian (IceWeasel / IceCat compared with Firefox). Iceweasel was too slow to be usable on the earlier version of the Raspberry Pi, but zips along nicely on the Raspberry Pi 2.
and then tried the Impress presentation application. It's a little bit slower compared to running on a full PC, but it's now fully usable. This means that rather than just being a platform for learning programming the Raspberry Pi 2 can now be used as a personal computer for homework etc. The main thing missing in terms of software capability on the Raspberry Pi 2 and another PC is Adobe Flash. This is because Adobe has dropped support for Flash and as it's a proprietary application it's not possible to get the source code to compile for the Raspberry Pi. With Adobe dropping support for Flash it's a dying technology, but unfortunately it's still used by some educational websites such as Educational City and Bug Club which my children have to use for homework. 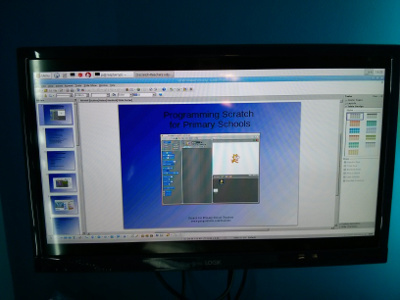 The new version of Scratch (version 2) also uses Flash, so that won't run on the Raspberry Pi. Fortunately version 1.4 still works fine and has continued to see some improvements supported by the Raspberry Pi foundation. I expect in a few years time flash will be used less and less, but for now it does mean that children may need to have access to a "normal" PC as well to be able to complete all their homework. It was not possible to run Ubuntu on the Raspberry Pi before as it is not available for the ARM V6 processor. Now that the Raspberry Pi 2 has an ARM 7 processor then it is now possible to run a version of Ubuntu. The normal desktop version of Ubuntu uses Unity which is slow enough on a low spec PC, so is unlikely to be usable on a Raspberry Pi, although it may be possible to get a version that uses a lightweight desktop to work. It should therefore be possible to install Lubuntu which uses the LXDE desktop environment similar to Raspbian. One version of Ubuntu that is available is Ubuntu Snappy Core. Ubuntu Snappy Core is a development of Ubuntu designed for improved reliability required for Cloud services and in the new Ubuntu phone. There is an Internet Of Things (IOT) version of Ubuntu Snappy Core currently available on the Raspberry Pi website. There appears to be a few issues with the image at the moment as I am unable to install additional software due to a certificate key problem, but it sounds promising for the future. Another big announcement is that Microsoft Windows 10 will be available for the Raspberry Pi 2. Now I'm not a big Windows fan (in fact I rarely use it outside of work) but if people want to run Windows then that's their choice. It's worth noting that this is not going to be the full desktop version of Windows 10, but is instead a light version specifically for running on devices as part of IOT. As far as the main operating system is concerned it is likely to remain as Raspbian. Windows 10 will be provided free of charge, but only for non-commercial use. I expect that that anyone developing a commercial application that needs Windows 10 would need to purchase a license from Microsoft. The Windows devices software currently provides wiring which is a programming language similar to that used on the Arduino. This is developed in Windows Visual Studio on a PC and then pushed to the device. With no desktop environment on the Raspberry P I expect programming for Windows 10 is not going to be as easy for children as using Raspbian, but may be popular with existing developers that are used to developing with Microsoft Visual Studio. Where does this leave the old version? One of the good things about the Raspberry Pi 2 is that it's maintained physical and software compatibility with the older versions. So it's provided the performance improvements for those with the new Raspberry Pi, but it's not alienated anyone running the older ones. The original Raspberry Pi is still suitable for teaching programming and for physical computing, the new version just does this faster and adds a couple of new options. The old Raspberry Pi still works fine as a media centre and as a server and all the other things that people have been using it for. So if you've got an older model there is no need to get rid of it just yet, but obviously the new model is nice to have. The model A+ is the current, smaller, cheaper version that uses less power and therefore may be a better fit for some circumstances. I expect the A+ will be upgraded to the new processor eventually, although I'm not sure if that will mean an upgrade to the memory to 1GB as the current A+ has only 256MB. It sounds like this it is unlikely to be until late 2015 before the A+ gets the upgrade though, so if you want a low power Raspberry Pi (to run on batteries) or are on a tight budget then you may still want to consider the A+ instead. Overall the reaction from the public seams to have been overwhelmingly positive, but there has been some criticism and some of the comments have unfortunately been quite rude or hurtful. I could go off on a tangent and describe how this sadly appears to be the way of the modern digital age where more and more people seam to think that it's fine to throw insults when sending comments via the internet, but rather than take the bait from the trolls here's just a few of the comments and why I think they are unjustified. Why not add the xyz feature? It seams that you can never please everyone and there are several people complaining that the feature they want adding has been overlooked once more. Whilst I would love to have a 200GHz hecta-core processor with 4PB of memory and a 100GB fibre network interface it would not be possible to do so at the same low price. The important thing is that the price is kept low and that they continue to meet the educational aims of the foundation. The Raspberry Pi has already proved a huge success with the maker community and whilst there are always going to be people that won't more it's a great achievement to get so much for such a low price. Not available for $35 - and why it priced in dollars anyway? The Raspberry Pi is priced in US dollars as that is how the components are sourced and it means that the price can remain steady regardless of currency fluctuations. The majority of Raspberry Pis are made in the UK (Wales in fact) and are available through suppliers in many different countries using local currency. The price excludes local tax and additional shipping charge (where applied). I bought mine for about £30 including free delivery which is excellent value for money considering what you get. The Raspberry Pi has been and continues to be a victim of it's own popularity. They are currently making 20,000 Raspberry Pis per day so although most suppliers sold out very quickly when the new version was announced there shouldn't be too long to wait. Those of us that tried to order on the first day that the first Raspberry Pi went on sale had to wait for several months so hopefully a few days wait shouldn't be too bad. There have been quite a bit of criticism of the announcement that Windows 10 will be available from the Raspberry Pi. I am a fan of Linux, I like the fact it's free and open source, I like the fact it's developed by the community and like the choice it gives me. I do not see the need to start criticising others for choosing something different. The main operating system for the Raspberry Pi is still going to be based on Linux and if others want to install Windows (and want to pay the license fee if they develop a commercial device) then that is their choice. The one group of critics that I do feel a little bit of sympathy for are those that have just bought an older version to find that there's now a new version come out that's better for the same price. Unfortunately that's just a fact of life and I've been in the same position myself. Technology moves on and it's frustrating to find that something you bought one week drops in price, or (as in this case) that a better version is now available at the same price. There wasn't any announcement about the new version until it was available, but that is the same as most of the industry as once a new one is announced the sales of the existing product will stop. I don't think there is a large enough product margin to significantly discount the price of the old one so a decision would have been made about when was the best time announce availability of the new one. One thing to remember is that the Raspberry Pi you bought last week is still just as good today as it was last week and was still excellent value for money then. It's still a great device for learning programming on, or for use around the home. In fact I still have several of the original 256MB Model B Raspberry Pis which we use to turn our TVs into smart TVs using Kodi (formally XBMC) and at only $35 that's a bargain. The Raspberry Pi has just got better. I am sure that there is no other computer that has the flexibility and processing power of the new Raspberry Pi 2 and charges just $35. If you have an older Raspberry Pi then you can continue to use that as you did before, although the speed improvement on the new model is impressive. This is all good news as far as I'm concerned and I'll be looking forward to the even faster Raspberry Pi 3 in a few years time [here's hoping], but this provides an amazing computer at an unbelievably low price. I've got some ideas of my own, but mostly I'm look forward to seeing what school children manage to create with the new faster processor on the Raspberry Pi 2.
Review of a Android Tablet - use for school homework.